Analysis: Cox injured his foot during a Jan. 13 playoff loss to the Saints and had surgery at some point thereafter. Although he wasn't using a walking boot Tuesday at team headquarters, there doesn't seem to be any expectation of active participation in the Eagles' offseason program. 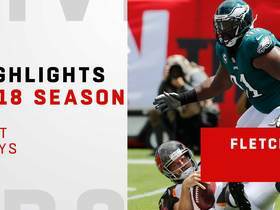 The 28-year-old defensive tackle is entering the third season of a six-year, $102.6 million extension, coming off a 2018 campaign with career highs in sacks (10.5), quarterback hits (34) and tackles for loss (12). 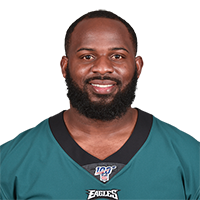 The Eagles announced Monday that Cox underwent right foot surgery but is expected to be ready for training camp, Tim McManus of ESPN.com reports. Analysis: Cox reportedly suffered the injury in the Eagles' divisional-round playoff loss at the hands of the Saints. The 28-year-old is currently in a boot but has been following protocol set by doctors, per McManus. 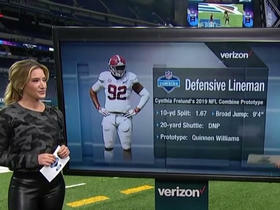 The fact that the Mississippi State product should be ready for training camp is a positive sign, as he's coming off a dominant season with 46 tackles (33 solo) and 10 sacks. Cox will not play in the Pro Bowl due to a foot injury, Cam Inman of The San Jose Mercury News reports. Analysis: Cox injured his foot in Sunday's NFC divisional-round loss to the Saints. It is unclear how serious the injury actually is, as he would likely only play in the exhibition contest if he was at full health. The defensive end posted a career-high 12 sacks this season. He will be replaced in the game by DeForest Buckner. Cox had three tackles (one solo) and 1.5 sacks in Sunday's loss to the Cowboys. Analysis: Cox entered last week with a five-game stretch without a sack but has 2.5 sacks in the last two games. The 28-year-old hasn't exceeded three total tackles in a game since Week 6, making him difficult to trust as an IDP option. Cox had three solo tackles and a sack in Monday's 28-13 win over the Redskins. Analysis: Cox was able to end a five-game sack drought Monday as he was able to bring down Mark Sanchez in what was essentially garbage time. The 27-year-old has 35 tackles (26 solo) and five sacks this season. Cox had six tackles (three solo) and a sack in Thursday's 34-13 win over the Giants. Analysis: Cox found the quarterback for the first time since Week 3 to bring his season sack total to four. The 27-year-old combined for three tackles over the last two games, but he remains on pace for a career season. Cox reworked his contract with the Eagles on Friday, Adam Schefter of ESPN reports. Analysis: The new deal will save the Eagles $6.5 million in cap space this season and $11.7 million of cap space in 2019. Cox has eclipsed at least 5.0 sacks in each of the last three seasons with Philadelphia. Cox recorded four tackles (two solo) and half a sack across 52 defensive snaps in Sunday's win over the Colts. Analysis: At 27, Cox could be on his way to a career year, as he has already recorded 12 tackles and four sacks through three games. His high level of play makes him a major IDP candidate as the Eagles head to Tennessee to face the Titans on Sunday. Cox recorded five tackles (four solo), including a sack, in Sunday's loss to the Buccaneers. Analysis: Cox now has 2.5 sacks on the season and is well on his way to improving upon the 6.0 sacks he's averaged over the past two years. His success through two weeks has been even more impressive considering the schemes teams have deployed to slow him down. 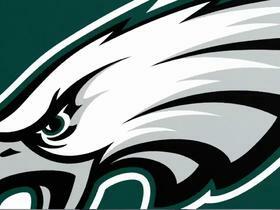 Looking ahead, Cox and the Eagles will look to notch a second win as they host the Colts in Week 3. Cox recorded two tackles and one sack in Thursday's 18-12 victory over the Falcons. Analysis: The Eagles rarely allowed the Falcons a clean pocket from which to pass, and Cox was a huge reason why, consistently overcoming double-teams and overall being far more impactful than his meager stat line would suggest. With that said, Cox did have a second sack called back by a defensive penalty on one of his teammates. The three-time Pro Bowler will look to continue his dominance in a Week 2 matchup with the Buccaneers. Cox recorded a sack in Sunday's victory over the Bears. Analysis: Cox had just one tackle to go along with his sack of Mitchell Trubisky, which he tallied early in the fourth quarter. The 26-year-old now has 5.5 sacks on the season. He saw 35 defensive snaps (64.0 percent) in the contest. 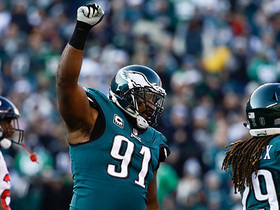 Philadelphia Eagles defensive end Chris Long forces sack-fumble, defensive tackle Fletcher Cox recovers. 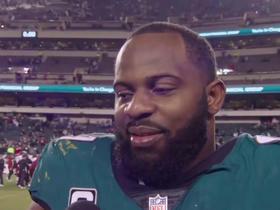 Philadelphia Eagles defensive tackle Fletcher Cox chats about his team's win against the Washington Redskins on Monday Night Football and looks ahead to facing the Dallas Cowboys. 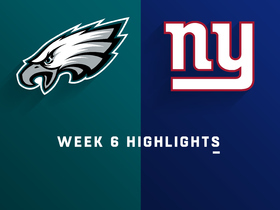 Watch the best plays from the Week 6 matchup between the Philadelphia Eagles and New York Giants. New York Giants running back Saquon Barkley dodges three Philadelphia Eagles defenders on a 9-yard run.